Master Bond EP17HTND-CCM is a new single component epoxy that is not premixed and frozen. It is more convenient to handle, apply and store than typical two component glob top systems. 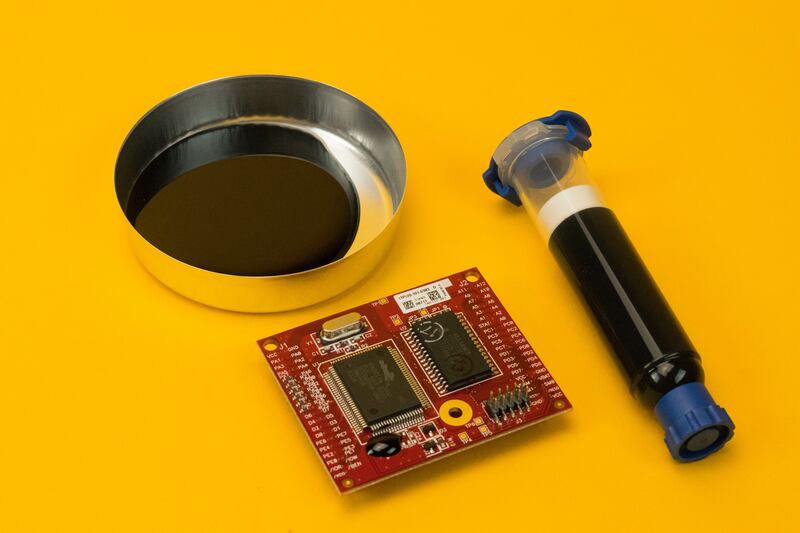 This black, heat curable compound has a flowable paste consistency ideal for glob top, chip coating and bonding applications. EP17HTND-CCM meets NASA low outgassing specifications and is serviceable from -80°F to +600°F [-62°C to +316°C]. This adhesive forms high strength bonds to a wide variety of similar/dissimilar substrates such as metals, ceramics, plastics, composites and various circuit board materials. EP17HTND-CCM is thermally conductive and electrically non-conductive even upon exposure to hostile environmental conditions. EP17HTND-CCM has a high volume resistivity of more than 1015 ohm-cm at 75°F and over 1012 ohm-cm at 400°F. Its thermal conductivity is 9-10 BTU•in/ft2•hr•°F [1.4423 W/(m•K)] at 75°F. Also noteworthy is its ability to resist many chemicals including acids, bases, salts, fuels, oils and many solvents. Formulated for various electronic applications, EP17HTND-CCM cures readily in 1-2 hours at 350°F [175°C] with a relatively low exotherm upon curing. It can be dispensed from a syringe, either manually or with an automatic dispenser. Master Bond EP17HTND-CCM is available for use in common size syringes ranging from 10 cc to 30 cc. For storage simple refrigeration at 40-45°F is recommended. Click below to download this release in the format of your choice. Click an image to download a high resolution version in JPEG format.